ASP.NET model binding framework takes care of validating a model based on data annotation validations. This works well when a model is being bound with request data. However, at times you may need to create and fill a model programmatically. In such cases, although the model properties are decorated with data annotation validators, they won't validate the data because they are not invoked at all. Consider a situation wherein users are uploading CSV files from the client machine on to the server. Your application is supposed to read those files and assign the values from the file to the model properties. The model objects are then stored to some database. In this case data validations won't fire and your model will be held in an invalid state. Since model validations are not being invoked ModelState.IsValid will always return true and there won't be any easy way to detect and display these validation failures. 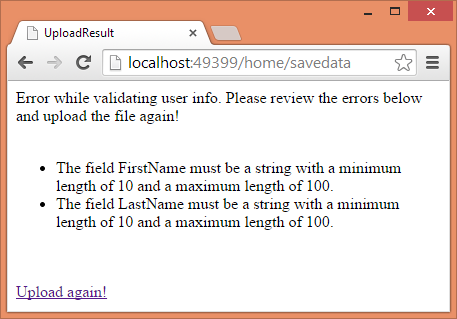 Luckily, ASP.NET MVC allows you to validate a model object via code. This article shows how. The UserInfo class consists of three properties - FirstName, LastName and BirthDate. All the model properties are decorated with [Required] attribute. Additionally, FirstName and LastName properties are decorated with [StringLength] attribute. Both of these properties also have MinimumLength set to 10 just for the sake of testing. Notice that the UploadResult view displays validation errors through ValidationSummary() helper. Now let's see the most important part of the application - SaveData() action method. ViewBag.Message = "Error while validating user info. 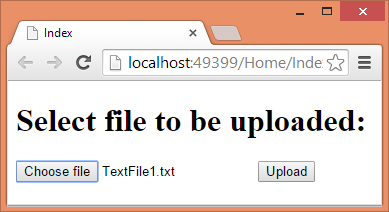 The SaveData() action iterates through the Request.Files collection and gets hold of the file being uploaded. In our example it is assumed that only one will be uploaded. You don't need to save this file on the server because your interest is in the CSV data in the file. That's why the code reads the content of InputStream of the file using Read() method. The Read() method reads the content in a byte array. This byte array is converted into a string using GetString() method of the ASCIIEncoding class. The string data is further split into a string array using Split() method. Notice the code marked in bold letters. The code creates a UserInfo object and assigns FirstName, LastName and BirthDate properties from the string array created earlier. If you see the sample data shown earlier you will realize that FirstName and LastName doesn't meet the requirement of [StringLength] attribute. 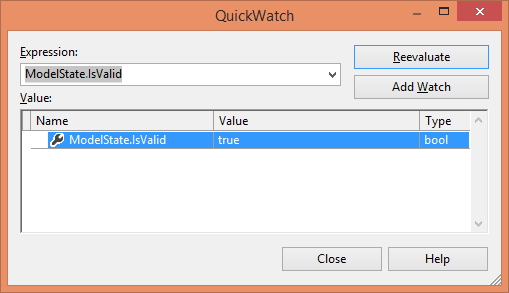 However, at this stage ModelState.IsValid will be true because data validations are not invoked yet. Next, the code uses TryValidateModel() method that invokes the data validations. There are two variations of this method - ValidateModel() and TryValidateModel(). Both of them come from the Controller base class. The former method throws an exception if there are any validation errors whereas the later method silently returns false in case validations fail. If you check ModelState.IsValid after the call to TryValidateModel() you will see that it returns false because there are validation errors. Notice that UploadResult view uses ValidateSummary() helper to display the validation error messages. As you might be aware ValidationSummary() or ValidationMessage() helpers work only if ModelState dictionary contains some entries. In our example these entries are added by TryValidateModel() method. Since ModelState dictionary contains some entries the ValidationSummary() iterates through them and displays the validation errors. That's it! Try running the application a couple of times with invalid as well as valid data and see if everything works as expected.